This isn't the story of cookies. 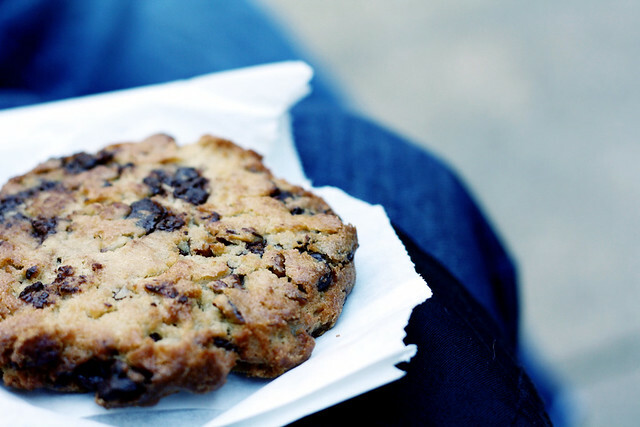 Although, there was a cookie the approximate size of my hand involved. Nor is this the account of astounding breads baked in wood-fired ovens, though we had some of those too. 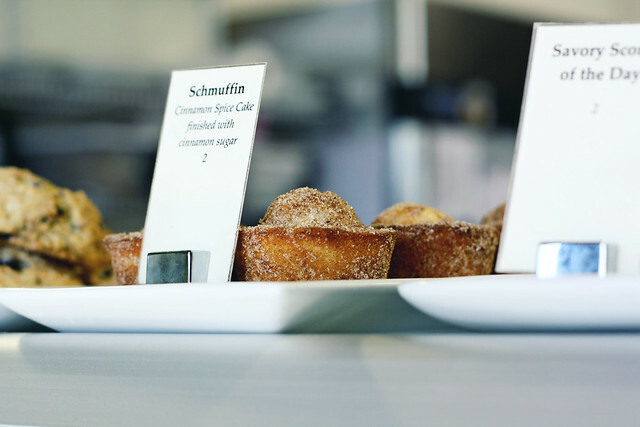 Nor is it about Schmuffins, teeny cakes that want to be doughnuts, which are not only exceedingly tasty, but are also the most adorably-named breakfast ever. 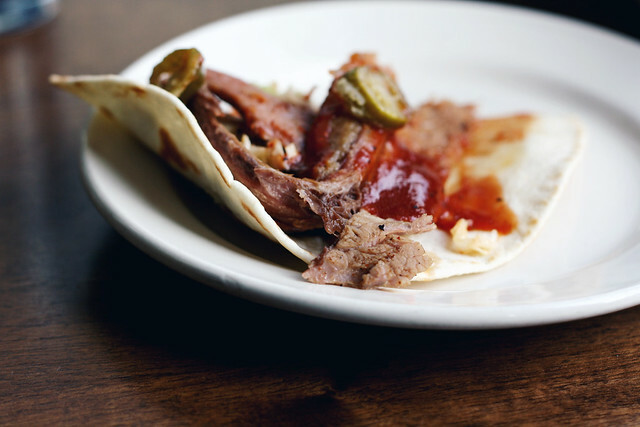 It's not even about Texas-style beef brisket tacos, with meat that's been smoked long and low for hours. Or the crispy jalapeño rings that set fire to that smolder, and matched dangerously well with tall, skinny glasses of Lynchburg Lemonade. It could be about the waiter we met, with his shock of blond hair and high cheekbones. He talked really fast and he knew his stuff. But it's not. It's really a story of an unexpected friendship that became one of the most important in my life. And how, last fall, that friendship took us to Louisville, Kentucky. More years ago than I'll mention, I was sitting in a university Canadian Lit lecture. It was the first day of class. I was next to a friend, and he and I were chattering away, waiting for things to get started when, right before the professor began to speak, this lanky guy wearing a baseball cap plunked himself down in the chair on my other side. He had a grin that took up nearly three-quarters of his face. In one of those painful exercises of "getting to know everyone", the professor decreed we were to introduce the person we were sitting beside to the rest of the class. I looked to my buddy and laughed at the prospect of how I could embarrass him in front of the girls assembled. But then, she added "you're talking to the person on your left." That would be the random boy in the hat. And that's how I met Brett. Thanks, Professor Rose. Years later, years of postcards and basketball games and cups of coffee, Sean and I had the honour watching Brett marry Kathryn, a woman with a smile that somehow manages to overshadow even his, and who is far more vivacious, talented, sharp and funny than he probably deserves (and I say that with honest affection). She's a gem. I only wish they lived closer. They settled in Kentucky, and had two of the cutest children you'll ever see. Those two imps call us Miss Tara and Mister Sean, and it is knock-you-over sweet. I've not told Brett this, but Louisville suits him. His Canadian accent has changed, so that certain words now sound deeper when he speaks them. There's a hint of drawl, a warm rumble in tone that sounds the way Bourbon tastes. I wrote about the trip we took to see him and his family in UPPERCASE magazine, issue 12. There, I share the details of our adventures. 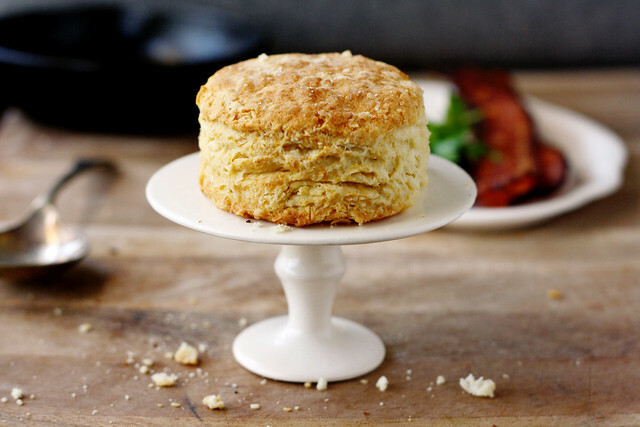 Adventures, and a recipe for buttermilk biscuits. I don’t have any direct biscuit heritage; I am without pedigree when it comes to those storied biscuits of the American south. My only claim, the only reason I hold the making, eating and sharing of biscuits so high in nostalgic regard is the simple fact that I like biscuits a whole darn lot. It’s a bit of an obsession. 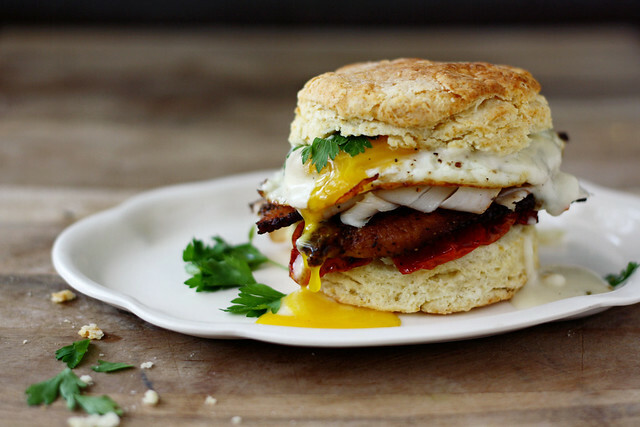 The trouble is, biscuits are one of those things that you can spend a lifetime perfecting. Close cousins to a scone, the type of biscuits I’m talking about are a simple quickbread; the purest forms are flour, a levener, a fat and a liquid. My recipe isn't bang-on traditional; it instead borrows from a few sources, and has a few tricks, in the aim of assuring those of us who didn't grow up making biscuits the guarantee of success. Although the biscuits are saved for UPPERCASE, I do have a recipe to share. Let me introduce you to the Hot Brown, what's usually an open-faced sandwich of roasted turkey and bacon, under a blanket of Mornay sauce (a cheesed-up version of Béchamel) that's then broiled until bronzed and bubbling. It was invented in the 1920s at the Brown Hotel in Louisville by one Frank K. Schmidt, as a late-night offering to their guests who'd tired of the dance floor. It is a divine mess of salt and richness and gooey cheese that doesn't suit every day, but is gluttonously welcomed once in a long while. Thank you, Mr. Schmidt. While a Hot Brown is usually served with sourdough toast, you can see that's not the direction we're taking today. And, much like a journey down south to catch up with old friends, it's a good trip to take. My variation on a classic, inspired by a slew of recipes, including that from the Brown Hotel. Use your favourite sturdy biscuits here, as they're the base to an impressively weighty filling. I apologize for the egg on top. It's not conventional, and I seem to be fallen into an unintentional theme:"if it's tasty, put an egg on it. It'll be even better." For once, the blame is not entirely my own. On our last morning, with Brett and Kat and their charming children as company, we went out for breakfast. Sean ordered a Hot Brown, and the waiter suggested two eggs on top (Louisville's got some great service). He is a brilliant man. Seriously. Crack an egg and don't look back. It's the business. In a medium saucepan over medium heat, melt the butter. Slowly whisk in the flour, incorporating fully so there are no lumps. Continue to cook the mixture, stirring constantly, for a minute or so more. In a slow, steady stream, pour in the cream and whisk to combine. Cook, stirring often to make sure the sauce isn't catching, until the sauce comes to a boil, around 3 minutes. Turn the heat to low, and stir in 1/4 cup of the cheese. Season to taste with kosher salt and ground black pepper, and nutmeg if using. Keep the sauce on the lowest heat to keep it warm, stirring occasionally. Preheat a broiler. Cook the eggs to your liking; my preference is either fried sunny side up, or poached. At most, over easy. But, it's your breakfast so do what you'd like. My only note is that they can be slightly undercooked as they'll be blitzed under the broiler and nobody likes rubbery eggs. Get them ready and then set them aside for a moment. Place the two bottom halves of the biscuits on a small baking sheet or an oven proof plate. Top each bottom with a few slices of tomato. Place a slice of turkey on top, then divide the bacon between the two (breaking the slices in half to keep things neat, if needed). Place your eggs on top. Pour over some of the Mornay sauce and sprinkle the reserved cheese on top. Keep the rest of the sauce hot for serving. Put the biscuit tops beside the filled bottoms, cut side up. Toast the sandwiches under the broiler until the sauce starts to bubble and the cheese begins to brown. This should take maybe a minute. Remove from the oven, garnish with whole parsley leaves (which bring a much-needed, fresh crunch), and top with the second half of the biscuit. Serve immediately, with the remaining Mornay sauce passed alongside. Makes 2, which should serve 2, but I won't bat an eyelash if you don't want to share. Of course fresh, vine-ripened, fragrant-as-all-get-out tomatoes are the ones you want for a sandwich, especially one of such lineage. That said, there comes a time in darkest winter when said sandwich is on your mind and there's no such beauties to be had. I realize I've not helped matters by talking about Hot Browns in January. In these desperate times, I wish I could be so steadfast as to say to wait until September, but I can't. I'll tell you to get yourself some local offerings and roast them in a low oven to concentrate their sweetness to at least a suggestion of summer's best. I roasted my slices, seasoned with salt, pepper and a miserly pour of olive oil, at 300°F (150°C) for about 2 1/2 hours. You can go lower and slower, about 200°F for as much as 4 hours, if you're that patient. A few drops of hot sauce, dripped over before the biscuit lid is squished on, is how I like to do things. I listened to a story teller a few nights back. Not a man telling a story, but a man whose entire being and was occupied with the business of weaving his tale. His cadence was long and loping but deliberate, and it suited his southern drawl. The words meandered along the way to their destination, unhurried. If I squinted my eyes, it wasn't hard to imagine those words puffing out from his lips and into the air like smoke upon an exhale from a cigar. The effect was entirely soothing, but so riveting was its interest that you could not help but hang onto every word. A hypnotist's lullaby. When he stopped, I wanted to linger there in his phrases. To climb inside and stay a while. Pulling me out of the blissful lethargy of his words was hunger. In this story, at the heart of it all, he used a sandwich as the embodiment of all he felt familiar. By the end of that story, he made a sandwich sound really, very good. He had been talking about New Orleans, and talking about po' boys. Talking about a sandwich that is messy, sloppy and soaked. He liked his with gravy, with the bread making valiant efforts to sop up as much as it could but failing, so that juice drips from that bump right where the heel of your palm ends and your wrist begins. A sandwich that requires your elbows on the table to provide proper purchase. Without the necessary components of his ideal on hand, I turned to another, equally sodden sandwich to appease my yearning - pan bagnat. 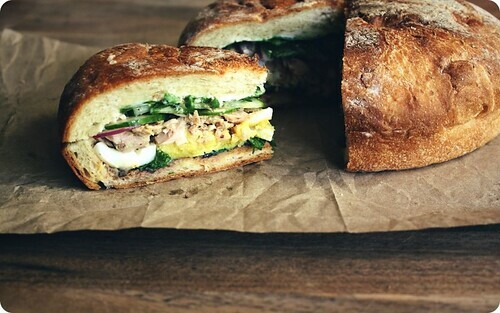 A speciality of Nice, pan bagnat is a pressed sandwich stuffed to its crust with the goodies of a Niçoise salad. From bottom up, I'll walk you through it. 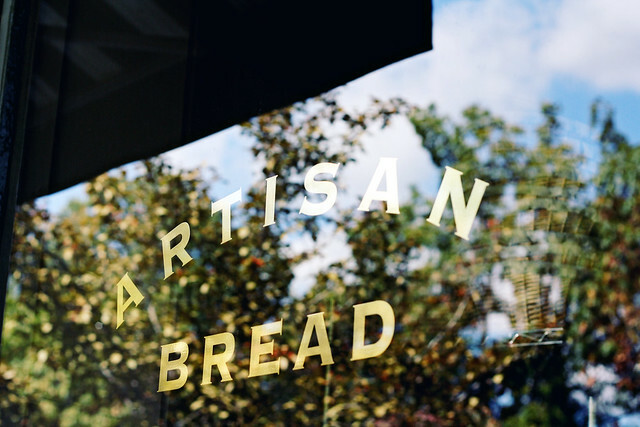 It starts with good bread. You need a boule with a crust substantial enough to stand up to the richness and literal weight of the filling. In this version, it's spread with tapenade then covered in whole basil leaves. Tiles of hard boiled egg are arranged next, then chunks of oil-packed tuna dressed in an assertive vinaigrette. Sliced red onion and cucumber are last in the instructions, but I added mixed greens for substantial crunch (and again, all of these were bathed in the vinaigrette as well). The whole thing is wrapped tight and pressed, with the layers evening out and settling in. I should say your sandwich will be prettier than mine; I was so eager to share a slice with you that I hardly waited to snap the photo. Be patient. It needs that rest. After a few hours the bread swells with the moisture and becomes softly chewy. Bite in, and there are layers of salt and acidity, of flavours and texture. The fatty blandness of the egg yolk melts into the seasoned tuna and rounds out the vinegar. The basil emerges from the murky depth of the tapenade, two big flavours in balance. The salad on top of it all is refreshing and palate clearing and gets the mouth ready for the next greedy bite. And oh, a few bites in, you'll be able to move from two elbows to one firmly planted on the table. But, that said, keep this isn't a sandwich to be put down once you've begun eating. If you try, things will get complicated. Don't worry, now with the free hand you can grab a glass of cold, cold wine. You won't need much else. Maybe a napkin. And a good story, if you're lucky. From Everyday Food: Fresh Flavor Fast(Random House Canada, 2010). I have just started cooking with this book, but for those who might be familiar with it's predecessor,Everyday Food: Great Food Fast, this title follows much the same style and feel.